Discription:Puranpoli is to Maharashtrians what cheese is to the French. Or locally brewed beer to the Germans. Or Chicken Tikka to the Brits. ;-) Basically, close to the heart. Even the tolerantest of Maharashtrians could resort to violence, if you told them that Puranpoli is a drab little dessert. In a heavy-bottomed pan, bring the water for the stuffing to boil. Wash the Chana Dal and add to the water. Let the dal cook uncovered on medium-high heat. Please DO NOT give in to the temptation of pressure-cooking the dal. It makes the texture of the stuffing too runny to handle. In the meanwhile, knead the dough for the cover using 1 tbsp oil and lukewarm water. (You could substitute a portion of the water with milk.) Keep the kneaded, duly covered dough aside. The dal should be cooked by now. It is well-cooked, if a grain of it can be easily pressed between the thumb and the index finger. Turn the heat off. Drain the water on top of the dal into another container. Transfer the dal to a food processor now, and grind till all grains of dal have fallen apart. Transfer it back to the heavy-bottomed pan. Add the rest of the ingredients mentioned under 'stuffing' and start cooking it once again on low heat. The Puran/stuffing will have to be stirred every now and then while cooking, because it tends to stick easily to the bottom. The Puran is cooked when it looks smooth, with every grain cooked and fallen apart. It is thick enough, when a flat spatula inserted in it stands straight. Like this. Keep the cooked Puran aside to cool down. Cover it, if at all necessary, only partly for the steam to escape. Once the Puran has cooled down completely, knead the dough for the cover once again using the rest of the oil. Divide it in five or six portions, depending upon how big you want to roll the Puranpolis.Heat a Tava/griddle. Divide the Puran/stuffing in as many portions as the dough. Roll out one portion of the dough at a time in a small circle. Place a ball of Puran on it. (The ball is usually 2.5 to 3 times bigger than the quantity of dough.) Enclose the cover over the stuffing tightly, and seal it off. Click here for detailed photographs of this step. 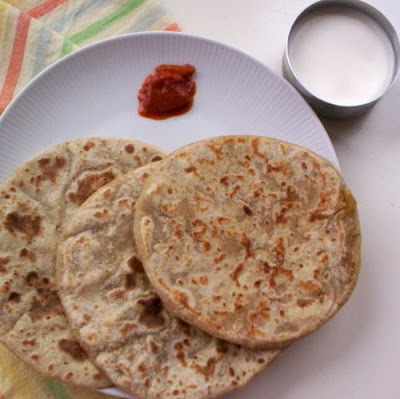 If you are fairly good at making stuffed parathas, then you should have hardly any problems at this step. Roll out the Puranpoli using some rice flour. The cover needs to become so thin, that you can see the Puran inside. Transfer it to the hot griddle. Roast both sides, using some ghee, until golden brown spots appear. Do not flip the Puranpoli too often.Repeat steps 10 & 11 to make remaining Puranpolis. Serve fresh and warm Puranpolis with dollops of ghee or with a bowl of milk to dunk it in. At my place, we enjoy Puranpolis with milk, only when they are not warm any longer. Have these Puranpolis for lunch on a lazy Sunday and take a siesta after that.